Do God’s Instructions to the King of Judah Apply to Us Today? It’s dark times indeed for God’s people. The prophet Jeremiah is his mouthpiece to speak truth. God sends Jeremiah to the king of Judah with a message. This message begins with some commands and ends with a promise for obeying and a threat for disobeying. Through Jeremiah, God tells the king to do what is just and right. Then he breaks it down. First, don’t wrong or hurt foreigners, orphans, and widows. This isn’t the first time or the last that God shows his heart for foreigners, orphans, and widows. Perhaps the first mention is in Deuteronomy 10:18. Later Paul testifies that his purpose is to bring God’s good news to his own people and to the Gentiles, that is non-Jews, which would be foreigners (Acts 26:23). And James tells us to look after orphans and widows (James 1:27). 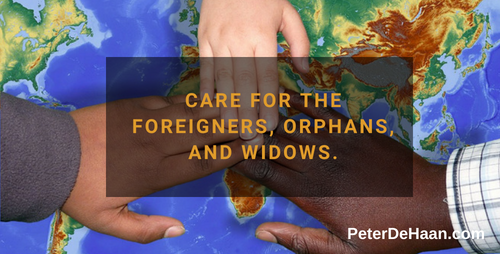 Yes, foreigners, orphans, and widows are important to God, so they should be important to us too. Second, God says don’t kill the innocent. This command to not murder appears in the ten Commandments (Exodus 20:13). And Jesus models it with the woman caught in adultery when he releases her from being stoned to death (John 8:10-12). Then God gives the king a promise if he obeys: future kings will continue to rule—implicitly success. However, if the king disobeys, the palace will be razed—implicitly failure. We can easily extend God’s command to the king of Judah to us today, because we see these principles supported in the rest of Scripture. However, the promise for obedience and threat for disobedience, may or may not apply to us. Regardless if there are rewards for obedience or punishments for disobedience, we will do well to help foreigners, orphans, and widows. This pleases God.